Alpha Centauri A and B in close orbit around each other, and Proxima Centauri, which is about .22 light-years (about 1.3 trillion miles) away from the other two stars. Around Proxima Centauri orbits a high-metal-content world named Eden, and orbiting Eden is a small space station named Hutton Orbital. Commanders who reach it become honorary members of the Hutton Orbital Truckers, whose membership is over 3,000 strong. The trip to Hutton Orbital from Alpha Centauri, where you’re forced to start the trip, takes about two and a half hours in ‘supercruise,’ a mode of faster-than-light travel enabled by a frameshift drive. I know this first hand because I went there in my ship, a Cobra Mk. III. For the duration of the trip, I sat in front of my computer watching simulated space dust whiz past the edges of my monitor as I wondered if what I really wanted to be doing on a Wednesday evening was to stare at a screen resembling a glorified Windows 98 screensaver. 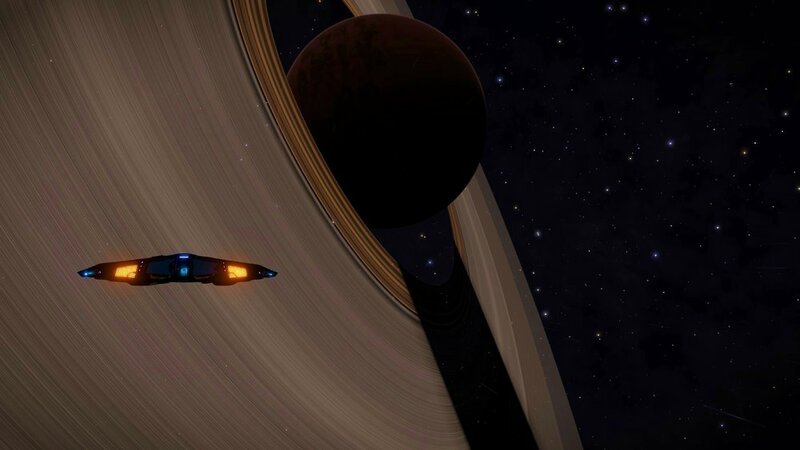 My reservations were easy to forget as I reverted to normal space near Hutton Orbital just as “Norwegian Wood” by The Beatles came on the Truckers’ custom streaming radio station. Eden loomed in the background and Proxima Centauri burned bright red to my left, casting long shadows across my Cobra’s dashboard as I requested docking clearance and touched down smoothly on landing pad #1. No fireworks went off to celebrate my entrance into the Truckers’ ranks. No alert appeared on my screen to congratulate me on the long trip. I didn’t get any achievement notifications, and if you look at my player profile, you’d be hard-pressed to find any other hint that I’ve ever been to Hutton Orbital either, despite the souvenir mug I bought from the station’s commodities market. This is because Hutton Orbital Truckers (HOT) are organized almost entirely outside of “Elite: Dangerous”, the game that I had been immersed in for hours. Their forums, missions, statistics and radio station-- almost everything about them-- are all hosted at huttonorbital.com. The Truckers aren’t the only group creating their own emergent gameplay experiences with the game, which was developed by Frontier Developments and released in 2014, but is set in the year 3303, after humanity has achieved interstellar travel. There are the Fuel Rats, who rescue stranded players; the Smiling Dog Crew, who act as mercenaries and pirates and attack other players; and various groups of players who regularly embark on expeditions across the galaxy, helping each other and sharing stories and video of their unique experiences. Many other computer games have groups like this that work together and enjoy similar types of gameplay, but Frontier seems to have almost intentionally developed a game that creates what are sometimes called emergent experiences that project an in-depth game universe, but which neglect, unlike most other games, to force a narrative onto the player. “You’re effectively no one,” says Allen Stroud, a senior lecturer at Coventry University in the United Kingdom. Stroud holds a doctorate in Science Fiction and Fantasy world-building from the University of Winchester that included work compiling official lore from three games: the original “Elite” published in 1984, “Frontier: Elite II” from 1993 and “Frontier: First Encounters” from 1995. Stroud originally compiled the information for Frontier after their successful Kickstarter campaign in 2012, in order to help them create a game that was faithful to the previous games’ storyline and player lore. He then used that research to earn his doctorate and write the “Elite” themed novel, “Elite: Lave Revolution”. Stroud was also a founding member of Lave Radio in 2013, a streaming radio station based in an orange Sidewinder (another model of spaceship) in the Lave system inside Elite (but accessible on Earth at laveradio.com). Lave Radio was one of the first sources of news specifically for “Elite”, discussing game development news before the official release of the game in December of 2014. They also played spoofy advertisements, considered fan suggestions and speculations, and eventually created and hosted “Escape Velocity,” a full-cast audio serial. After the official release of “Elite”, they began to read news from “GalNet” (short for “Galaxy News Network”) the in-game news agency that updates players about major happenings in the fictional game world, like attacks by the non-human Thargoids. None of this was coordinated by Frontier as they developed “Elite”. Fans of the old games and people excited about what Frontier was attempting to do coalesced into groups like Stroud’s, which eventually became factions inside the game, too. Some of the factions and radio stations have been recognized with in-game representations like Lave Radio’s orange Sidewinder or the HOT mug, and many player groups start custom minor political factions through an application process on the Frontier forums. These groups can then seize and fortify territory as part of Frontier’s designed game mechanics. The faction spaceports generate trade, combat and exploration missions that players can complete to support their factions. However, these game functions are secondary for groups like the Truckers or Fuel Rats. The Smiling Dog Crew even abandoned their official player faction, preferring not to have a specific territory for their victims to seek retribution against. “I think Frontier have almost fallen into this,” Stroud said. “The more that they do stuff but leave gaps, the more it offers opportunity for players and participators to effectively create their own story within that." With no expectations put on “Elite” players, they are forced to create a meaning, their own reason for continuing to play. The gaps aren’t literal holes in the game universe any more than a couple hours of boredom or an empty lot in a neighborhood is a gap in the reality “Elite” mimics. The gap is simply a lack of direction that game designers usually apply to players. Everything that's necessary for an accurate simulation is there, but it actually really is empty, mostly meaningless space. “Elite” has plenty of that empty space too, something the game’s galactic scope makes inevitable. Frontier has simulated around 400 billion stars in a 1-to-1 virtual model of the Milky Way galaxy. The software they developed, called Stellar Forge, procedurally generates star systems based on mass calculations within a set of nested cubes. The mass contained in each cube is calculated based on what is known about the shape of our galaxy, and then the stars and planets are generated based on what that amount of mass would likely do during the last 13 billion years or so based on what we know about Big Bang theory. The alternative-- saving data for an entire galaxy worth of planets and stars on a hard drive-- is impossible with current computing technology. Instead, Stellar Forge uses mathematical and scientific concepts about the Milky Way’s origin to recreate star systems each time a player enters it. There are no random elements in the formula, so each player always sees the same galaxy. The game then inserts objects like space stations and planetary bases. 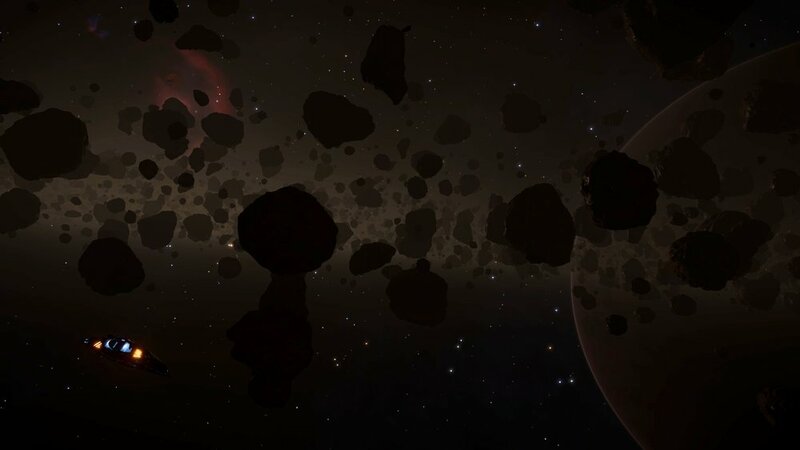 According to an interview with Frontier CEO David Braben, over 160,000 known star systems are added from catalogs, including new discoveries like the Trappist planets (and known planets like Earth, too). Star constellations change to accurately reflect a player’s position in the galaxy, allowing them to look into the sky, pick out a pinpoint of light from a distant star, and then actually travel there in the game. “Elite” lacks a unifying storyline, forcing each player to create their own unique experience, rather than proceed through something that has been written and designed. "Once you have players that are willing to accept that they are not the hero of the story-- they will not change the universe-- they start to invent their own stories, they start to talk about their own stories,” Stroud said. And players have certainly done that, creating their own narratives and sharing them online. Almost every forum concerning “Elite” has at least one thread full of stories from players about their gaming experience, and the uniqueness of each experience means it’s impossible to tell fact from fiction. Many stories are a blend of both. As a video game designer and developer, Modzeleski has had to look at emergent gameplay from the other side of the screen as players adopted his game’s functions to suit other playing styles. One glitch in his game, which he actually discovered himself, spawned a new speed-run “metagame.” Instead of creating a patch to eliminate that modification, Modzeleski decided to allow the new game type to develop on its own, as a new facet to “Gunworld”. He thinks games like “Elite” peel back layers of gameplay that have always been assumed to be necessary as part of a game before: violence, competition, the constant attainment of new goals, and flashy rewards. “If you look back and even say ‘well does the game even need to be fun?’ and you're able to peel that back and able to get a little more creative, that's where we start seeing things that are a little more experimental or more artistic," Modzeleski said. “They never wanted a Luke Skywalker plot, they always wanted you to be almost anonymous," says Stroud. In that near-anonymity, players find themselves not only free to choose their own play style, but actually driven to create new gameplay experiences altogether in a facsimile of a galaxy otherwise out of reach. For someone who has always wanted to explore the stars, the game offers a tantalizing opportunity to lose myself in my imagination.